Taylor Steele is a surf-filmmaking legend, but he's the first to admit: "I wouldn't be able to make this film." He's talking about Momentum Generation, Jeff and Michael Zimbalist's recent HBO documentary, which chronicles how Steele and his childhood friends redefined surfing as a mainstream sport in the '90s. It's a goofy stance, for sure, but he's got a point. It'd be hard for the dude who caught Kelly Slater's first big airs on camera, or who helped Pennywise and Blink-182 blow up, to tell this particular story. He's too close to it all. That's why he opted to be in front of the camera for once, joining much of his old crew (Slater, Rob Machado, and Shane Dorian, among others) to offer his perspective on the glory days. Now, Steele wants to offer the Zimbalists "huge congrats" for their efforts in sifting through all those interviews, making sense of them, and finding a "human story." He's right. The 103-minute movie maintains an impressive balance, charting the careers of many of the sport's biggest names and illustrating the bonds of brotherhood without ever feeling too tortuous. If you haven't watched yet, you should. Best of all, it's one of those special kinds of docs that offers rewarding insights for diehards and an illuminating orientation for newbies. Following Momentum Generation's release, we called Steele to talk more memories, music, and what it was like working with Lindsay Lohan that one time. Thrillist: How was it being on the other side of the camera? Did you learn anything from Momentum Generation that surprised you? Taylor Steele: I definitely learned a lot about each of the guys in it -- different perspectives on things and how intense the dark times were for everybody. Because when we'd see each other, we'd be happy to see each other and not really go into that deep stuff. It's definitely changed our relationships for the positive. Reliving those tough times, and finding out about how tough they were, really makes you understand each other better. What are your favorite memories from your crew's early days at Benji Weatherley's house? Steele: Just every afternoon, going out on the front porch and watching the waves with like 10 of us. And the peanut gallery being so, so wrong. Every wave was ridiculed. Comments were made about style or how [a surfer] blew it. And then every now and then a good wave would happen, and there'd be cheers. It was that banter you only get with really close friends. [Pro surf legend Todd] Chesser would lead that. He had a wicked sense of humor. It was cutting, but it was funny. So we'd all just sit there and write off everybody. The "you won't go" stories are great. What were the craziest you witnessed? Steele: There were ones where they'd climb on top of a super high bridge, [say "you won't go,"] and jump off after a night of drinking, or where they'd streak through bars. Those were the savage ones where most people couldn't keep up with Chesser. Todd was obviously such a big surf mentor to everyone, but was he also a video mentor for you? Or did you have to find someone else for that kind of guidance? Steele: His whole thing was basically, "Don't be a sell out" and "have fun." So I took those elements from him as a mentor. But as for the equivalent of pushing myself in big waves, I was looking for that with other filmmakers, and I didn't really find one. Chesser and I had a little bit of a different relationship: I was super close to him, but whenever it would come to video time, he didn't want to be perceived as a sellout by filming with me. He would disappear. So all the footage I've ever caught of him? He didn't know I was filming. Steele: He would go early morning and surf off the wall, away from the main scene. I got, I feel like, two of his best waves on video in the first Momentum [surf film]. I just showed up every day with that workhorse mentality of dawn to dark, being at Pipeline. So if anything happened, I would get it. I went for six months every year, so I was pretty committed to it, and I think I won him over in that sense. He's not one of those guys who would give you a compliment, but he's one of those guys who if [another video guy] showed up, he'd be like, ‘Hey, this is Taylor's spot,’ and kick them out. Your first Momentum vid became a bit of a surprise hit. How'd you get into filmmaking in the first place? Steele: I was lucky. I started really young [at 12 years old]. My friends and I would take turns videoing, so I was more someone wanting somebody to video me [surfing], and that was the easiest way -- if we all took turns. So I would edit my video stuff down, and I would edit theirs down and give it to 'em. 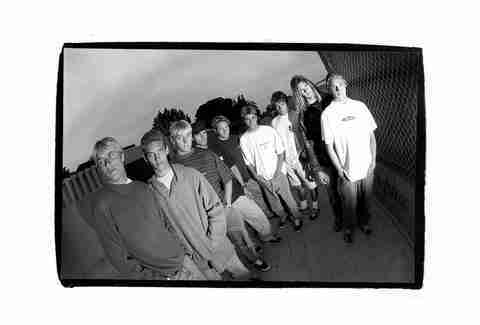 Then I really wanted to make surf films a career, but never really thought it was possible -- until Momentum. I was making Momentum as this surf film, but not really expecting anybody to see it. I was just doing it because I enjoyed it, and I was going to college, not knowing what I was going to do after. Obviously, I wanted people to see it, but I didn't think that was going to happen. It's been said that getting a strong section in one of your early vids could really impact a career. To what lengths would people go to ensure they looked good? The punk music pairings in your first films were groundbreaking at the time -- and many of the musicians cite your early vids as major fan-base amplifiers. How would you go about discovering those bands and picking the music you'd use? Steele: Finding music back then was a different ballgame. I would go into record stores in Encinitas, where I grew up, and I'd look at the local bands. If their cover looked good, you'd buy it or ask for recommendations -- it was such a slow process to find [new] music. So I would just find these CDs and cassettes, and buy like 20 or 30 at a time and then play 'em. My friend Greg Browning turned me on to Pennywise, and he said he knew them so that made me listen to them with a different ear. Because the biggest pain for a filmmaker is falling in love with a song, asking permission to use it, and then they say no. You've already gone down this deep road of discovery and connecting it to the footage and then you have to take it out. So the fact they were already a yes made me imagine them working. Sprung Monkey, I remember I bought their cassette tape that was in the local band section, and I liked it. They only had three songs out at that time. So, it was really sort of raw, and looking back on it, I knew I needed to find a different way of making films than everybody else. Because I didn't have the quality that Jack McCoy or other [surf filmmakers] had. My quality matched that sort of punk-rock tone [of music]. Were there any bands you reached out to in those early days that broke your heart by saying no? Steele: Yeah, there's one in probably every movie. One of the ones that still hurts to this day is I put [Rage Against the Machine's "Guerrilla Radio"] on Bruce Irons' section. It was amazing. But they said no. How has your relationship with music changed? Steele: Nowadays, it's beautiful that every song is at your fingertips online, and that's a huge blessing. 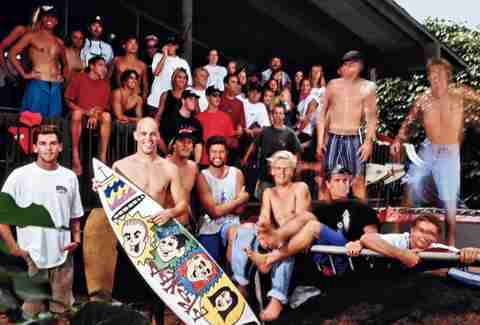 But if I'm making a surf film, it's really tough to not get nostalgic: When I was doing Momentum, Pennywise and Kelly [Slater] were staying at my house and playing pool for dishes. It was like we were all one big team, working toward the greater good. The bigger answer is I'm just a different filmmaker than I was at that stage. Now when I use music, it's a tool for emotion. So it's not maybe as prevalent, and it's more a feeling that's in the background. Who do you enjoy listening to now? Steele: I know they're pretty popular, but I'm a fan of Portugal. The Man; they have that punk-rock aesthetic, but then they have sort of a pop side, too. They just change in style so much that it keeps me entertained; it's not one thing through the whole song. I also like Dope Lemon -- we're always playing that around the house, the Angus Stone side project -- and Kevin Morby, too. How have the internet and social media contributed to the evolution of the surf film? Steele: There's definitely an interesting conversation to be had on what's going on with the way we digest videos. In a really broad sense, I love that you can make a 15-second video or a 10-hour TV series, and people have the attention span for either. It's easy to fall back into that nostalgia, where you made one video and people watched it for like six months and kept rewinding it. My goal nowadays is trying to figure out a way to make a longer-lasting effect and make people feel something and want to watch it again. That's the toughest thing right now. You watch something once, and you've already moved on because it feels so disposable. What effective strategies have you found for making something rewatchable? Steele: I think, in general, people are looking for moments and experiences. If you can show a film in a movie theater -- compared to on a laptop -- I think it's awesome to have people really absorb it, undivided. There's some great footage of the early Momentum tours in this doc. Do you have any favorite memories from those? Steele: The beauty of those tours were I would travel for three months with bands I was really good friends with -- to Australia, Europe, the East Coast, the West Coast. Like Blink-182, that was their first tour, on one of my movies. So there's too many memories, but one that sticks out is when Greg Browning got a fire extinguisher and went into a mosh pit and created this big smokescreen. [Laughs] It looked good, visually, and everybody was having fun -- but then they realized you can't breathe that stuff. So it stopped the whole show. It sounds like you've had a lot of adventures behind the scenes. What made you want to start doing the travel-style surf film? Steele: I started out just wanting to make surf movies, and I was basically as happy as you can be. But then I started making a formula surf movie, and over those years I got really bored and unhappy with the whole process, because I didn't feel like I was adding much to it. It was almost like a robot could be making those films, so I took a break from it. I went down a journey of going to new places that I just wanted to experience, and so those experiences are what I started to crave. Like going to Cuba or Iceland or India -- those were really important trips for me. And then it was more moments, like sitting with the gorillas in Rwanda and running with the bulls in Spain [for Missing]. How was running with the bulls? Steele: So, the idea was to take [Australian pro surfer] Mick Fanning all over the world in a two-week span and give him these new experiences you'd never get otherwise. We had done some things previous to that, but we were coming into day seven [at that point in the trip], and we looked on the schedule, and it was the last day of running with the bulls. They do it every day at 8am for two weeks, but the last day are the biggest bulls. So, we got there the night before and we just didn't know anything. No guide, no bearing on what to do. So we just started walking around, and we found where the running path was, and we just tried to learn really quickly what was going on. It was super surreal because we were celebrating with everybody that night, and then the next morning we had to get up with a hangover and walk down there, and it's like 7am and there's people starting to show up. Mick really didn't want to do this. He was adamant he wasn't going to do this. And so I said, ‘That's fine. You don't have to, but I'm going to do it.’ And that pissed him off. So then he goes, If we're going to do this, we're going to do this right. Steele: Then we heard a gunshot way down the way and couldn't see anything. Because everybody around you is jumping up and down, trying to see the bulls and how far away they are, before they need to start running. So you're just jumping up with the crowd, trying to see, and you hear this gladiator roar. It's like a wave of sound coming toward you. I ran like three steps forward, and I realized I wasn't gonna make it -- where I was was completely walled in and really narrow. So I turned and started running back, and Mick was gone at that point. He started booking so I couldn't see him anymore. But people kept falling because they would look back, and then they would trip going forward because of the uneven road. That was the scariest moment of my life, and I know it because my vision went super narrow and hyper-focused, almost tunnel vision, like this really primal state. I just kept running, and right as they were coming, I jumped to the side and let them pass. It was such a relief. No kidding. What do you want to do next? Steele: [Meditation] would be on my to-do list. That and go to Antarctica. Steele: It feels like it's too early to talk about that now, but I'm working on a surf film that I want to be sort of a hybrid of everything I've done before. Maybe a little more rock 'n roll than the tempo of [my last film, 2017's Proximity]. But with that same sort of learning from everybody -- the viewer and the subject. Would you ever want to do a full-on feature-length, fictionalized surf movie or TV show? Steele: Yeah, that's interesting to me. I can't say anymore -- how 'bout that? Because there's stuff that I'm working on that's in that vein. It seemed like 2012's First Point, the Lindsay Lohan-starring short you did with Richard Phillips, was sort of toe-dipping in that kind of direction. How did that come about, and how was working with Lindsay? Steele: When I was living in Bali, I felt really, really removed from just what was going on in contemporary culture. So I spent six months in New York, diving in and absorbing everything: going to music shows, going to art galleries, meeting new people. I met Richard Phillips, this super-talented, really successful Gagosian artist, and he was a surf fan. He just said, ‘Would you ever be interested in making something for one of my shows?’ That's where that came from. Working with Lindsay, this was at a time when she was making her first comeback and she was very professional and very, very ready to work. But there were some swimming scenes, where she would come up from the water, and it's supposed to be like really serene, but she'd be coming up and spitting out water. So it was funny to try to get that shot perfect because after one take, she was like, ‘I'm done! We're not doing that again!’ I think she got it like two more takes later, but having to deal with a high-end actress and have that conversation and know that I have no power... [Laughs]. What are your favorite fictionalized depictions of surfing? Steele: This is gonna sound weird, but Surf's Up. I think those guys did a good job with that one. I thought they captured the feeling of being in the water really nicely, you know? Which I think is hard to capture in a fictional way and give it that breadth. I feel like too many feature films are about man versus nature, and I don't think that's the theme that pulls people into surfing. At least not me. Big Wednesday was another one that captured the feeling pretty well on a mainstream level. But if you think about how surfing's been portrayed, it's mostly been the Point Breaks; that Brady Brunch episode; Batman, I think, went surfing; Goofy; and Fast Times at Ridgemont High. Some of those stigmas are pretty intense and pretty inaccurate. Well, Fast Times is probably not that inaccurate -- there are a lot of dudes like that. But that was sort of our whole point when we were coming up was to be the opposite of that. Looking back on all those ones, I think North Shore is actually pretty funny timing, with Kelly's wave pool and it actually being possible that someone could win a wave pool contest that's never surfed in the ocean and then get sponsored. The doc covers Kelly and Baywatch bringing surf culture more into the mainstream in the '90s. But I'm curious about the Kelly Slater video game, which I remember being more of a thing for my generation. Steele: I think Baywatch brought Kelly to the forefront -- I don't think it was a good portrayal of surfing, but it was great that he got the public spotlight because he was such a great surfer and if any surfer was going to get that kind of public spotlight, he was the perfect one for it. Tony Hawk's video game was just this huge worldwide thing, and that sort of carried over into Kelly even getting a video game in the first place. I don't know if [Kelly's] really came even close to touching like a 10th of what Tony Hawk's impact was on a reach, but we were all excited he was doing it. Did you play it? Was that weird? Steele: I don't think I played it with Kelly, but I remember playing it with Rob [Machado] one time. It was a little surreal and comical. I don't think I played it enough to get good at it, but I thought it was a pretty fun game. That time was sort of a strange time because that's when it was all sort of like exploding to that next level, and it felt like anything was gonna be next. [A video game] felt natural, weirdly. Your crew became famous during the '90s. What was celebrity like in that world back then, and how has it changed? Steele: On a mainstream scope, celebrity was being on a TV show or a movie, like Baywatch -- being the most popular show at that time, I can't think of anything else that was really out besides that. And then for the surfing side of it, if you got a photo in Surfer Magazine, those things are read over and over again. So that was a big deal, and guys would have careers off just getting a couple photos a year. So those were the big things. Surf movies, when I first started, weren't really a big deal, but then as we got going it became sort of a popular way of getting exposure. The whole world felt much bigger [back then]. Like I would be surprised if somebody would have seen my film in Australia, or have it find its way down to Costa Rica in the early '90s, and it was a copy of a copy that had traveled down there. Everything was so much bigger and slower, and people would get annoyed and anticipation would build because it would take six months to get to a certain region. As far as transitioning into today's world of self-promotion, it wasn't that hard for a lot of us. We were already in that mindset of, ;No one's going to give us anything, so we need to get the word out and do it ourselves.’ So, we're used to marketing ourselves -- with the conscience of Todd Chesser on our shoulders saying, ‘Don't do too much, though.’ [Laughs] It's that fine balance of trying to get the word out without being a sellout. Your group was known for taking things above the wave. How do you see surfing progressing in the future? Steele: The obvious one is the use of wave pools and what that's gonna do to the surfboard design and the kind of surfing that will happen. I imagine it taking a little bit of a wakeboarding course, where the surfers who excel might even look more like wakeboarders, who are stockier and a little bit shorter, with a really low center of gravity. I imagine it more like -- and this is the part that I don't know if it's a progression or not -- surfers having set runs and then rehearsing them, almost like a gymnast. I can also imagine guys riding unique boards that are built better -- like asymmetrical boards that are built for special kinds of waves. What's exciting for me [as a filmmaker] is the platforms and the kinds of films people are making -- from the action films to the really heartfelt stories about the unknown people who aren't superstars. I'm excited there's a platform for that. And the technology for better films will be based on what kind of story you're telling. The beautiful thing about surfing is it's probably going to continue to splinter and splinter and splinter, and have so many different facets of what is cool and what is pushing the charge. Sean Fitz-Gerald is an L.A.-based writer who also recommends streaming Flowers on Netflix while you still can. Find him on Twitter: @srkfitzgerald.